(1) Minimum 500sq.ft space at good Commercial or Residential area. Owners of the space will be preferred. 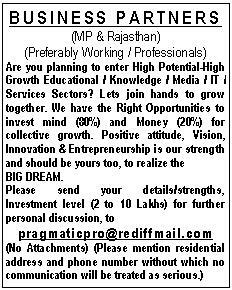 (2) Ambitious & vision to grow fast in the fastest growing Training Sector. Franchisees with PG qualificaion in Management / Commerce / English / Psychology Preferred. (1) Minimum Return on Investment Guaranteed. (2) Staff Training & Management Support. (3) National & local Advertising & Publicity support. Excellent earning potential & Bright future assured for the right gentlemen/ladies. UGF - 36, Block-3, GREEN CITY, E-8 Gulmohar, Arera Colony, Bhopal-462039 .